Total philanthropic donations reported to the Israeli Tax Authority between 1999 and 2011 increased by almost four times in real terms: from NIS 153 million to NIS 606 million a year. This study examines the characteristics of modern Israeli philanthropists based on data from all donors who requested tax credits for charitable donations to recognized non-profit organizations in Israel. The chapter examines the amount of money donated and the generosity of donors (measured in terms of donation as a percent of income), and explores the relationship between personal characteristics and the likelihood to donate. Philanthropist households differ from the general population in virtually every category examined, including annual income, family composition, and occupational classification. 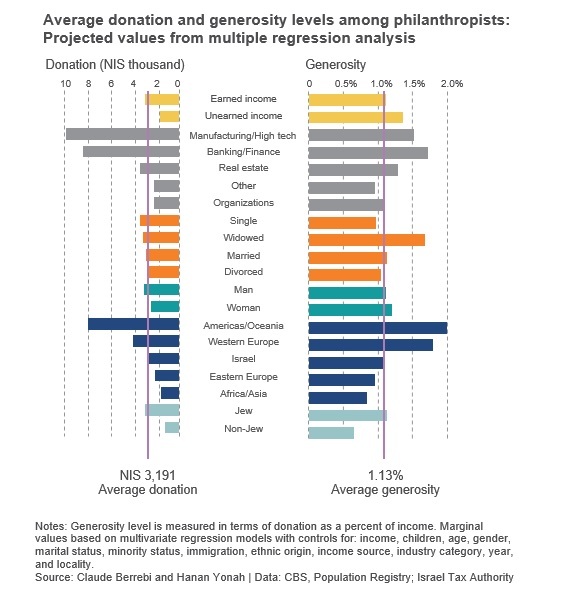 Israelis with higher incomes, individuals with earned (active) income, and those employed in real estate or organizations (e.g., NGOs, NPOs, and public organizations) are more likely than others to be philanthropists. Immigrants from America and Europe are more likely to be donors than those born in Israel, Africa, and Asia. In addition, philanthropists in Israel have more children, on average, than the general population. Households headed by women tend to be more generous in their contributions, in terms of donating a higher percentage of household income. Philanthropists who immigrated to Israel donate more money than Israel-born philanthropists, and are also more generous. New immigrants are more generous than veteran immigrants and donate larger sums on average, whereas immigrant philanthropists who have lived in Israel for 21 years or more tend to have similar contribution patterns to Israel-born donors. A possible explanation for this is that immigrants bring with them a different giving culture, but this gradually converges over time to the level that is customary in the local culture. Philanthropists employed in high-tech, manufacturing, banking and finance are the largest donors and are the most generous relative to philanthropists from other industries. On the other hand, only a small minority of employees in the high-tech sector are donors, and it is possible that philanthropic norms have not yet been established in this young industry, as they have in the traditional industry sectors. There is a significant underrepresentation of Arab Israelis in officially reported philanthropy in Israel – despite the fact that they make up about 20% of the total population in Israel, only 1% of reported philanthropists are Arab Israeli. Jerusalem and Tel Aviv are not among the top ten localities with the most generous residents. The study finds that the most generous localities in Israel include some of the more wealthy localities such as Kfar Shmaryahu and Savyon, as well as localities of low socioeconomic ranking such as Modi’in Illit, Hatzor HaGlilit and Tiberias.